Welcome to the wonderful world of Ewe Ewe! 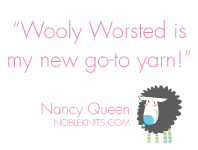 We are home to the super-soft superwash merino yarns called Wooly Worsted and the new Ewe So Sporty. We have fun knitting patterns that are easy to knit and fun to wear. Ewe Ewe also has free knitting patterns that feature our colorful superwash wool.